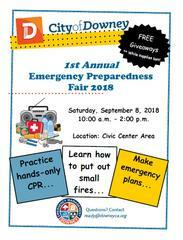 Please Join the City of Downey for the 1st Annual Emergency Preparedness Fair 2018. The event will held on Saturday, September 8, 2018 at 10:00AM - 2:00PM. Free Giveaways while supplies last.